Palestinian militants armed with AK-47s and rocket-propelled grenades battled Israeli helicopters and tanks Thursday in the bloodiest day since Israel invaded Gaza over a soldier's capture. At least 21 Palestinians and one Israeli soldier died as Israeli forces retook three empty Jewish settlements nearly a year after abandoning them. The government ordered the offensive after rockets hit the major Israeli city of Ashkelon for the first time, reports CBS News correspondent Robert Berger. Israel's main goal in extending its largest operation in Gaza since it unilaterally evacuated the territory was to carve out a temporary buffer zone to prevent militants from firing more rockets at Israel. Throughout the day, Israeli aircraft targeted Palestinian militants with missile strikes, while Israeli tanks took up positions among tightly packed Palestinian homes. Apache helicopters hovered overhead, firing flares and machine guns to support ground forces engaged in fierce skirmishes with masked Palestinian gunmen. After touring Gaza main hospital, Palestinian Prime Minister Ismail Haniyeh of the Islamic militant group Hamas called for international intervention to stop the Israeli offensive, which he called a "crime against humanity." Haniyeh said the Israeli push was "a desperate effort to undermine the Palestinian government under the pretext of a search for the missing soldier." Interior Minister Said Siyyam of the ruling Hamas party issued the Palestinian government's first call to arms since Israeli ground forces invaded Gaza last week, appealing to all security forces to fulfill their "religious and moral duty to stand up to this aggression and cowardly Zionist invasion." Siyyam doesn't carry much weight with the security forces, however, because most are loyal to the Fatah party led by the moderate Palestinian president, Mahmoud Abbas. Earlier this week, Palestinian militants from Hamas fired two rockets into Ashkelon. No one was hurt, but the rockets were the first to reach a major Israeli population center, indicating militants have obtained longer-range weapons. Hamas gunmen holding kidnapped Israeli Cpl. Gilad Shalit have not released any information since Israel refused to meet a Tuesday deadline to release more than a thousand Palestinian prisoners. "We're not going to negotiate," Israeli Defense official David Hacham said. On Thursday, Noam Shalit, the 19-year-old captive's father, urged Israel to consider releasing Palestinian prisoners in exchange for his son. "Everything has a price. I don't think there will be some sort of move to free Gilad without a price. That's not the way it works in the Middle East," the elder Shalit said, in his first comment on the government's handling of the affair. Acting on behalf of Arab nations, Qatar circulated a draft U.N. Security Council resolution Thursday demanding that Israel end its offensive in the Gaza Strip and release the Palestinian officials it has arrested. The draft faced immediate opposition from the United States and France, which called it unbalanced in its criticism of Israel. France's ambassador said he would offer changes, but U.S. Ambassador John Bolton suggested that Washington opposed the resolution entirely. Armed Palestinian groups should be called to account in a proposed U.N. Human Rights Council resolution blaming Israel for violence against civilians, Switzerland said Thursday. The new Council decided last week to make examining Israel's human rights practices in the West Bank and Gaza Strip one of its first acts. The anti-Israel resolution was proposed by the 57-member Organization of the Islamic Conference. Israel began its ground invasion on June 28, three days after militants linked to Hamas captured Cpl. Shalit in a daring cross-border raid. On Thursday, the fighting swelled, and so did the death toll. On the outskirts of Beit Lahiya, Israeli Apache helicopters circled overhead firing flares and machine guns as Israeli tanks took up positions or maneuvered among tightly packed Palestinian homes. 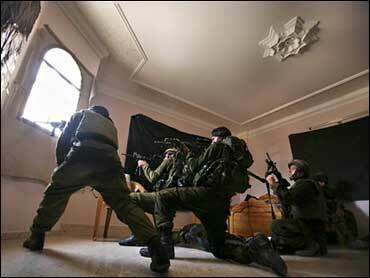 Troops took over one family's house, locking the inhabitants on the bottom floor of the home and posting snipers on the upper floors. Outside, large armored bulldozers erupted sand embankments to shelter tanks. Militants, many dressed in black masks, sneaked down narrow alleys to approach the Israeli forces and open fire with AK-47s and rocket-propelled grenades. Several militants were seen carrying roadside bombs with electric cables to be buried in alleys or near roads and set off as tanks passed by. During lulls in the fighting, some Palestinian women and young children fled their homes to evacuate the area on foot. Ali Ajrami, a tailor living in a farm house in Beit Lahiya, was trapped with his nine children in one room after Israeli tanks parked in a garden behind his house and special forces took position on the rooftops of neighboring buildings. Gunfire could be heard nearby. "We are trapped. I don't know what to do," he said. Ajrami said he had stocked up food and diesel fuel before the offensive, but was struggling to keep his children indoors. Twenty Palestinians were killed in air strikes and gun battles throughout the day, including eight Palestinians killed in aerial attacks in the Beit Lahiya area, Palestinian medical officials said. Health Ministry spokesman Khaled Radi said he didn't know how many civilians were among the dead. Radi said 62 people were wounded, including seven in serious condition, and 20 children. During lulls in the fighting, some Palestinian women and young children fled their homes on foot. The army said all of its attacks were aimed at militants. Lt. Col. Yaniv, a battalion commander, said there had been stiff resistance. "The Palestinians have been firing rocket-propelled grenades, automatic weapons and setting off explosive devices," said Yaniv, who gave only his first name under military regulations. An Israeli soldier died in one of the skirmishes, the first Israeli casualty of the incursion. The destroyed Gaza settlements that the troops re-entered, Nissanit, Dugit and Elei Sinai, lie just south of the border with Israel. Before Israel dismantled its Gaza communities last year, critics of the withdrawal warned the pullout would put more Israeli cities within rocket range.